We all know high blood pressure is a silent killer. The new hypertension guidelines 2018 have been revised several times over the years. Despite these revisions, there still has not been a decline in the number of individuals with high blood pressure morbidities. The new recommendation is for the blood pressure to be less than 130. What is High Blood Pressure and Why is it Important to Have Good Readings? Questions and Answer About the New Blood Pressure Guidelines? 1. Is blood pressure of 130 over 80 good? 2. How can I lower my blood pressure right now? 3. Do these guidelines apply to people of all ages? 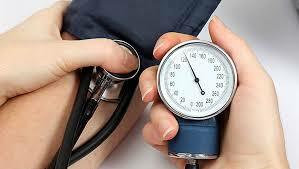 High blood pressure is now defined as 130 and higher for the systolic number, an 80 and higher for the diastolic number. The old guidelines had high blood pressure defined as 140/90. The Magnesium Solution is an excellent book on how mineral deficiencies play a role in high blood pressure. Blood pressure is the force that the blood exerts against the wall of the vessels. When the blood pressure is high, the vessels become damaged. Therefore, the organs will become damaged. The major organs affected by high blood pressure are the heart, the brain, and the kidneys. 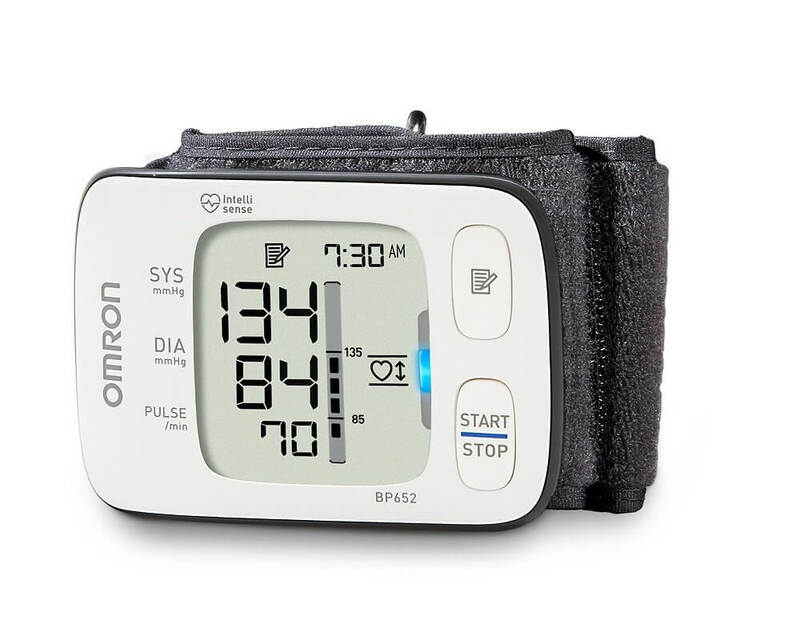 This is why everyone should be monitoring their blood pressure with a blood pressure monitor such as the Omron wrist monitor or the Omron wireless blood pressure monitor. In fact, kidney disease and dialysis have increased exponentially during the past 10 years. According to the Centers for Disease Control, 30 million people, or 15% of Americans have chronic kidney disease. This is alarming for the reasons I will spell out below. The majority of kidney disease and dialysis treatment can be prevented. The book Coping With Dialysis is an excellent book on how to avoid kidney disease. Dialysis is very hard on individuals. People undergoing dialysis need to have an “access” to get their treatment. Often time, these “access lines” get infected and the person gets a blood infection that can be fatal. If someone gets to the hospital in time and is able to get the clot buster, TpA, their chances of not having any disabilities are greater. 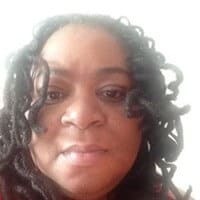 However, the majority of stroke individuals have disabling symptoms such as the inability to talk, express themselves, extremity paralysis, or a permanent limp. Once someone has already had a stroke, the likelihood of another stroke is increased. Strokes are life-altering. Often, people are not able to go back to their previous lives such as their careers. People should be monitoring their blood pressure daily. Therefore, it is imperative to get the blood pressure under control! The previous numbers were 140/80. This blood pressure number was considered prehypertension. Healthcare providers were finding out the old guidelines did not lower the numbers enough. The old guidelines also had a “pre-hypertension” phase. That guideline was removed. The guidelines were revised so that individuals could be treated earlier with lifestyle changes. Researchers found that complications occurred with the old numbers of 140/90. With these new numbers, a staggering 46% of Americans will now have high blood pressure. According to the American College of Cardiology, the majority of these hypertension cases will be among young people. There is compelling evidence that high blood pressure leads to cardiovascular disease and kidney disease. High blood pressure leads to stroke, heart attack, heart failure, and aneurysm. 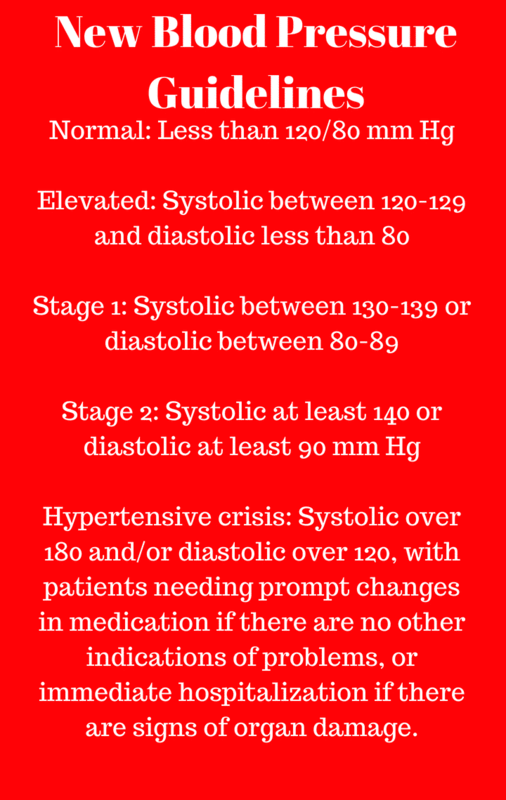 The only time a healthcare provider should prescribe someone with Stage 1 high blood pressure medications is if the individual has already had a cardiovascular event such as a stroke, heart attack, diabetes, or kidney failure. It is imperative that someone with Stage 1 high blood pressure is encouraged to make lifestyle changes. Losing just 5% of your weight can make a big difference in your blood pressure. Sometimes people need two or more medications to control their blood pressure. Doctors should try to use a combination pill if possible. Research has shown that people are sometimes noncompliant with their medications when they have to take more than one pill. The current guideline says that anything over 130/80 is high blood pressure. Therefore, this reading would be borderline. Now is the time to reduce the blood pressure by making lifestyle changes. Some lifestyle changes that are effective include decreasing salt intake, exercising for 30 minutes a day, and decreasing sugar intake. The DASH diet has been shown to lower the blood pressure in one week. The DASH diet also helps you lose weight and boost your metabolism. People have lost weight and reduced their body fat percentage with the DASH diet. Decreasing your sugar intake can also decrease your blood pressure because the insulin will be decreased. We know that high insulin levels raise the blood pressure. These guidelines apply to people of all ages.